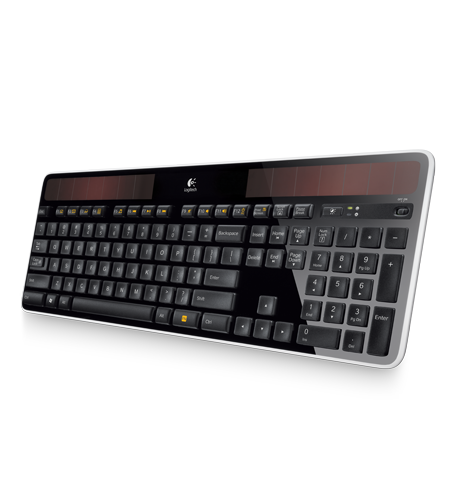 The Logitech wireless solar keyboard K750 (PC version) is very thin with two amorphous silicon solar panels. It seems very little light is needed to maintain the internal [rechargeable] manganese lithium cell. The button cell (ML2032) is replaceable and you can get the cell from Logitech or on ebay. On ebay just put in ML2032 and make sure its the rechargeable one. This one piece keyboard has no other ways to charge the internal battery. The short travel keys can be annoying coming from a full desktop keyboard. There are no separate multimedia keys like volume up/down. They are integrated into the function keys F1-F12. The power off/sleep button is annoyingly placed next to the volume up key and just above the backspace key. The windows application key seems missing, but its actually activated by pressing [FN] + [Print Screen]. The Num Lock, Caps Lock, and Scroll Lock indicators are missing. To see if Num/Caps/Scroll Lock is activated, you have to download onscreen display software from logitech. After all proper drivers have been installed, no complaints here. None are packaged with the keyboard. You have to download everything. The users guide is a simple 20 page pdf file and half in English. If you hate bloat software, then you'll like Logitech's method. You only download the software you want. This is not a bluetooth compatible keyboard. Logitech uses their own 2.4GHz wireless interface. The USB adapter is very small so that you can keep it in your laptop.